efore we get to my epic odyssey to Seattle and Tacoma, I want to sincerely wish all of you a wonderful Holiday Season. We don’t come out again until late January so this is my chance to take a minute to express my gratitude to all of you who read and use this thing. Publishing RCN has allowed me to barely survive financially while significantly upgrading my records and stereo equipment. Works for me. So thanks for that and apologies to my children! Traveling to Tacoma and Seattle for the first time, I had a long list of record stores with me. My quest was to check them all out and report back to you, our faithful readers. I know. It’s a dirty job… I couldn’t quite get to all of them. So I guess I gotta go back, right? 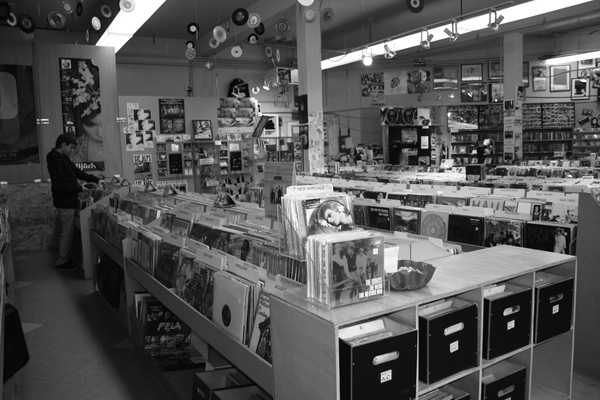 If I had to summarize, generalize and evangelize, I’d say Seattle’s record stores are generally smallish. But that works out fine because there’s not a lot of filler. These guys seem to work their asses off to keep the bins stocked with clean, cool collectable records. 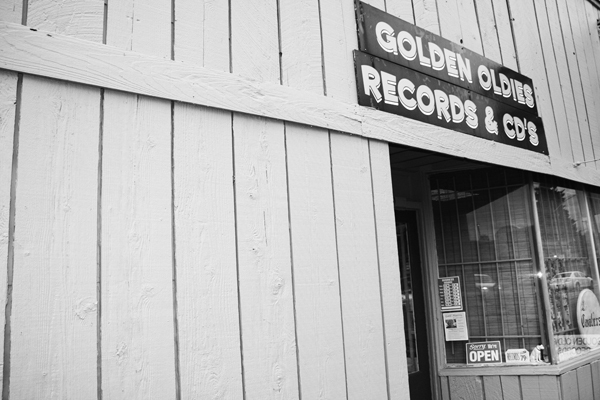 Especially if you’re looking for Pacific Northwest 45s and LPs. Everyone’s got ‘em on the walls. And we’re talking real beauties. Most of the storeowners I spoke with have been in the business for 15-30 plus years and can lay lots of knowledge and history on you. There are a couple of stores with 150,000 plus records on site, and small coffee shops with 600 really cool records for sale. Most of the records I looked at were in good condition. Prices are fair. Not cheap but considering the condition, well worth it. Most of the stores I went to were great for a guy like me who’s looking to fill in and upgrade. I apologize for the stores not yet mentioned. I will cover you. I am a completest. Eventually. I think Seattle’s a great town and a great record store town. The weather energized me and seems perfect for record collecting and coffee drinking and going home and drinking more coffee and listening to records. Sounds like a decent way to live to me. But it might not be for everyone. On the shuttle bus from the car rental lot to the airport for the flight back to Burbank, I was seated next to a woman dressed for business who was a corporate traveler type. “I can’t wait to get out of here,” she said to me. “Why,” I asked. “The weather, it’s so depressing. I can’t take it,” she said. Wow, she seems pretty upset, I thought. “How long have you been in Seattle?” I asked. “A day and a half…” she replied. So there you go. Maybe she just needs to spend some time digging for vinyl. It sure worked for me. I spent the first beautiful day in Tacoma and three glorious days in Seattle. 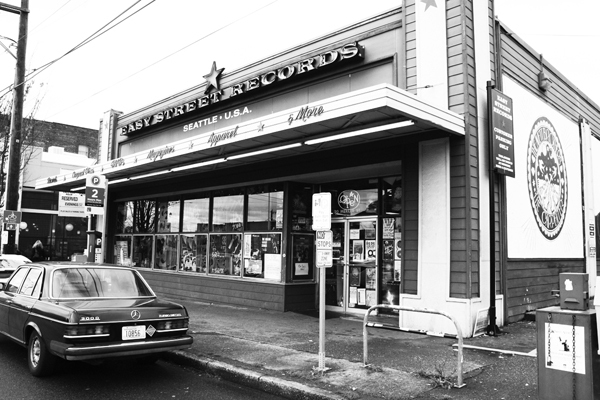 6th Avenue in Tacoma is a couple-mile strip where you’ve got no less than five good-to-great record stores. None of which look too picked over to me. My gut tells me there’s still some vinyl in them there thrift stores as well. You’re gonna have to dig. But the diggin’ looks pretty deep up there. 608 N Prospect, Tacoma 98406, right off of 6th Ave.
My first stop in Tacoma was at House of Records/Turntable Treasures. This wonderful record store has over 100,000 records on site and some great new and used audiophile stereo equipment for sale. 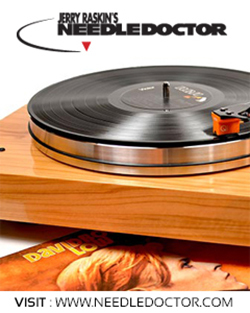 Get your turntable HERE. Give yourself lots of time. Peter, the owner has been in business forever, knows his stuff and is happy to share his knowledge with you. This is the kind of store that won’t let you make the wrong purchase. They really care. 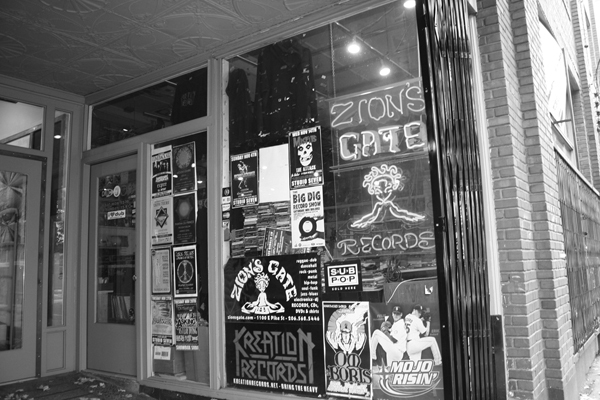 Just down 6th street are four more record stores. 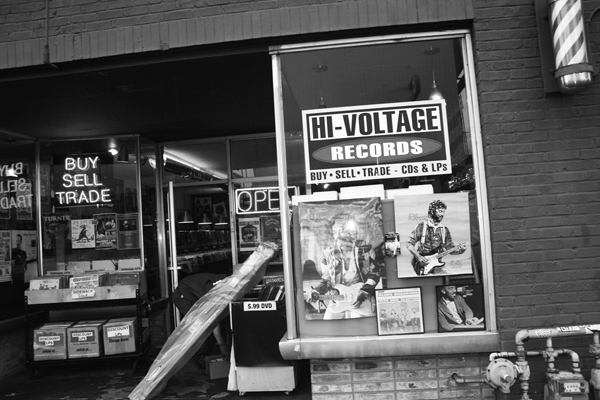 High-Voltage Records and Drastic Plastic Records are pretty close to each other. Kind of in the middle. High-Voltage has a lot of new and used LPs and CDs and Drastic Plastic is about half water pipes and the rest used vinyl and posters and clothing and sports stuff. 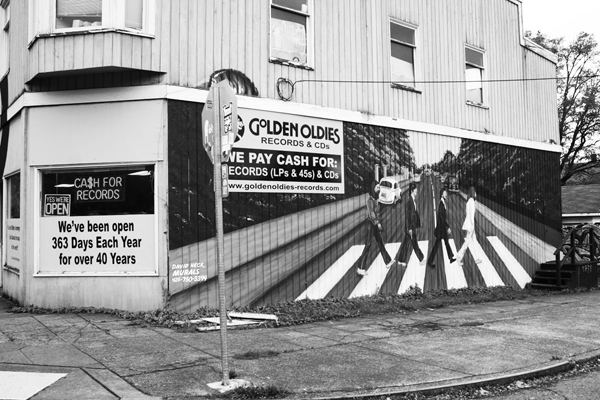 Smallish – amazing Pacific Northwest stuff on the walls. Rocket Records is another essential store. Owner Steve is knowledgeable, and he keeps his bins stocked. There’s some seriously collectible stuff on the walls there. Bring some dough. First stop in Seattle was at the Pike Street Market — home of Holy Cow Records. (They seem to have a fish market there too.) Holy Cow is smallish but there’s no fill. Owner Miles has been around for a while and has his sources to make sure the bins are stuffed with gems. A definite gotta-go-to. The Pike Street market is pretty cool, too. Lots of good food. 20 Mercer St. and in West Seattle at 4559 California Ave SW. Both locations are packed with plenty of new and used CDs and LPs with some cool collectibles on the walls, and the California Ave. location has a cool little restaurant in it. The only thing that would have made my visit to Easy Street Records better was to add some bacon. Which I did at the diner/restaurant inside the store. Good record store with a good restaurant with some good bacon. Heaven. The next store I stumbled into out of a light rain was Bop Street Records. Now I had heard of Bop Street. They seem to be on a lot of “Best Record Store” lists. 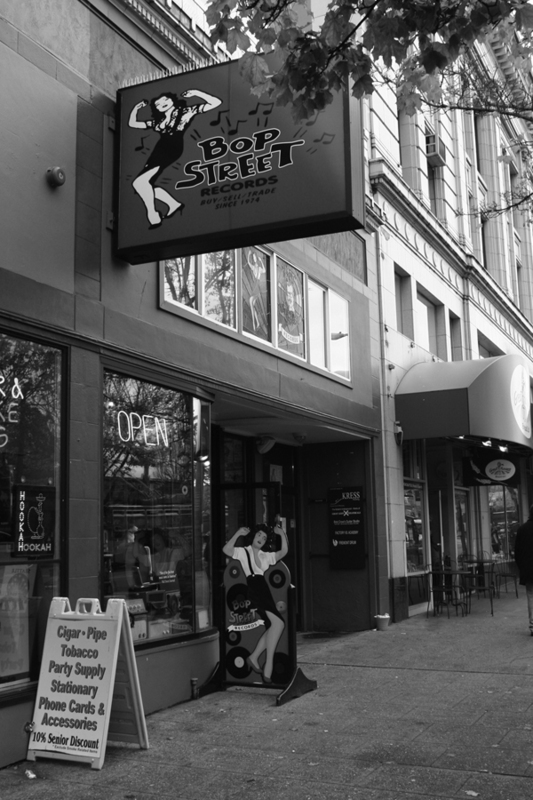 Bop Street had to move a few years ago into a bit smaller space. So they made the largest donation ever to the St Vincent De Paul society and gave away 200,000 plus records and moved their remaining 250,000 plus records to their newer, clean as a whistle location. I gotta say I was impressed. Plenty of room. High ceilings with tall ladders. Plenty of stools to sit on. Tables to look at records. And lighting designed so that you can really, clearly see what you’re looking at. I have never seen anyone provide lighting like that. With 250,000 records on site, all neatly organized, Bop Street caters to the serious collector more than any record store I’ve ever been in. “Your store takes the cake in the country” –Jonny Greenwood, Guitarist, Radiohead. 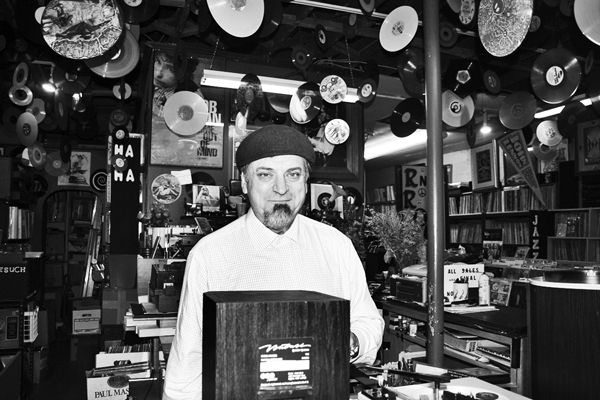 “The greatest record store in the country” –Simeon Lipman Antiques Roadshow. 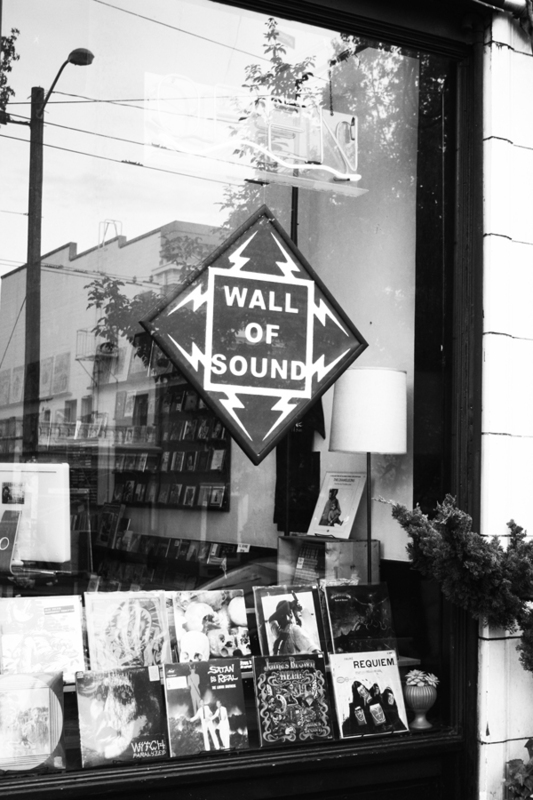 “One of the five best music stores in America” –Wall Street Journal. Bring plenty of dough as they have plenty of records. Definitely one of the essentials. Great reputation. 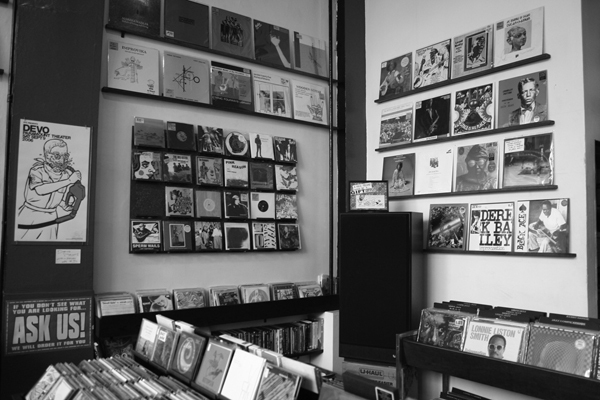 Small store packed with good clean records. NO FILLER. Not a lot of stores as good as this one anywhere to be found. More than just “a pretty nice place” Hawthorne Stereo is the anchor to what still exists of Seattle’s Audio Row. Hawthorne Stereo is a gear digger’s delight. 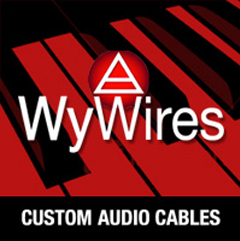 They’ve got many dozens of new and really cool used pieces of audio gear. Before you buy one of those Crosley toy turntables, check this place out. They’ve got some serious gems in there. 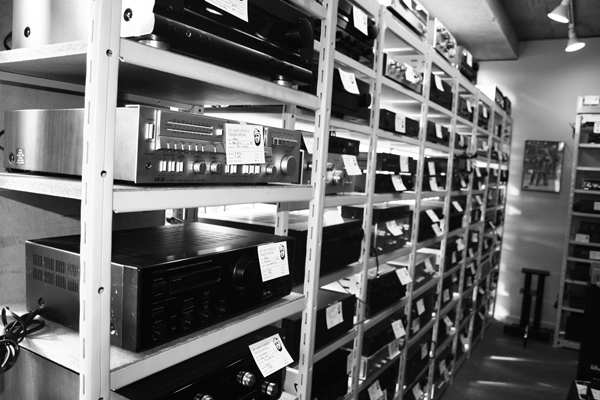 Definitive is the one of the main high-end audio stores in Seattle. These are the Linn LP-12 turntable specialists. 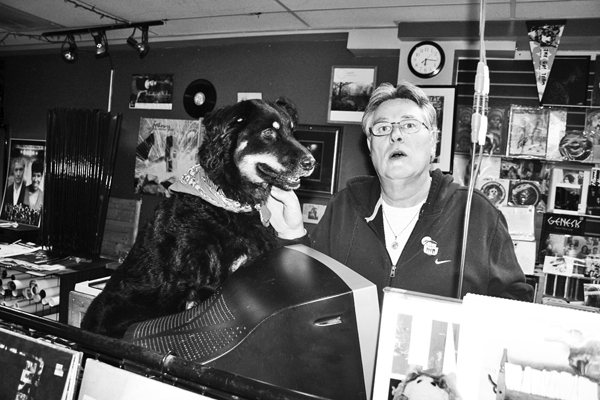 Showroom Manager Ron Paternoster can help you with all your audio needs. From killer, entry level all-in-ones to the most esoteric gear available, you want it to be Definitive. It’s Seattle. The sky is gray. The coffee is awesome and there are four of us digging through the bins at Porchlight Coffee and Records. The three 20-Somethings are digging behind me, going through some early ‘70s funk. Ones say’s to the other, “I wish I was alive in the ‘70s”. I can’t resist. 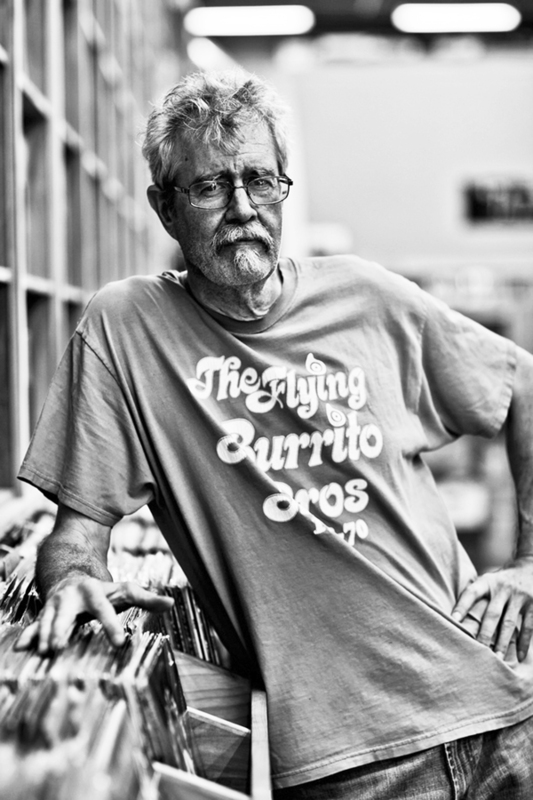 I tell him, “If you were alive in the ‘70s, you’d be really old right now.” They get it and we continued on digging through the few hundred extremely tasty records for sale there. Owner Zack Bolotin does a great job of keeping the bins filled with awesome titles in great condition. And he brews a damn good cup of coffee. The sign outside says, “We’ve Been Open 363 Days Each Year for over 40 Years”. On the inside, you can tell, they ain’t lyin’. Tons of vinyl. Golden Oldies. Check it out! Spin Cycle sells movies, records and games. A great neighborhood record store. 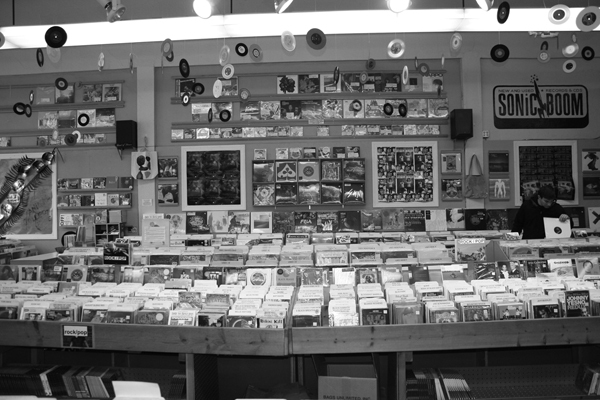 Silver Platters is a great chain of three Seattle-area stores with plenty of new and used CDs LPs and goodies. Essential. 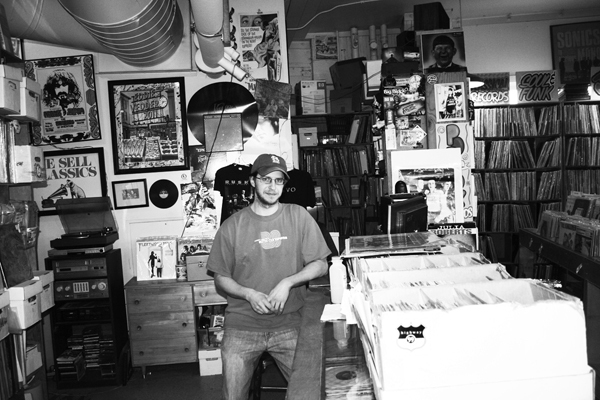 Voted one of the Top 25 Record Stores in the USA, Jive time is another smaller store packed with essentials. No filler. 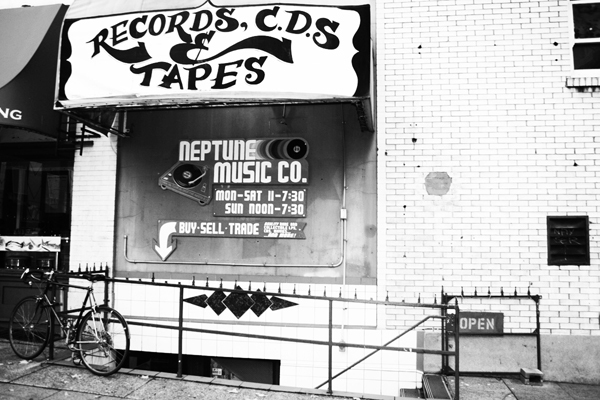 Underground and cavernous, Neptune Music Company is a gotta-visit store. Another great neighborhood record store. 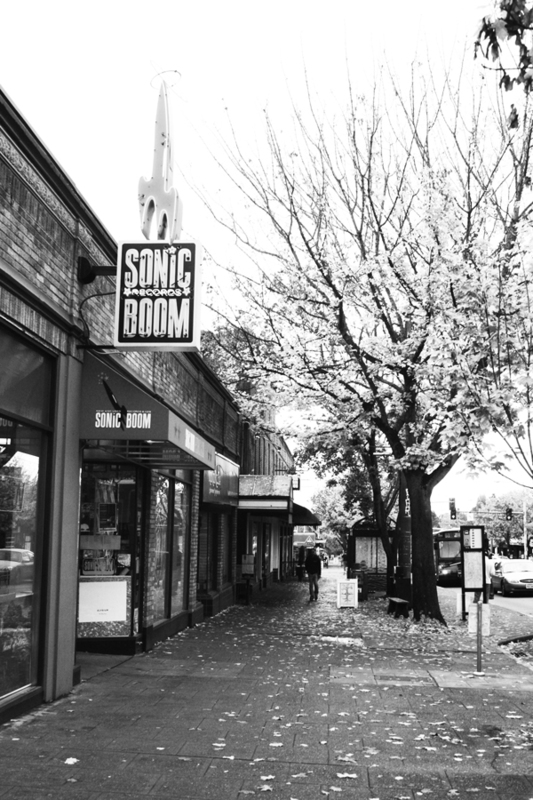 Sonic Boom is a wonder-ful place to duck into for some first-rate new and used vinyl and CDs. 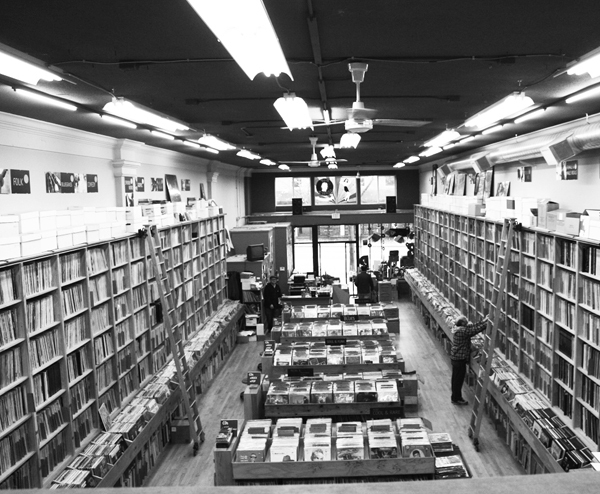 Number 16 on Rolling Stone Magazine’s top 30 Record Stores in the US! Georgetown Records is one of the coolest stores in town. It shares a space with Fantagraphics Publishing. 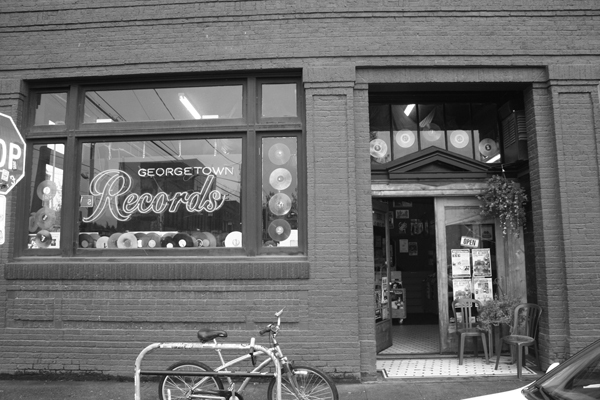 Seattle is full of great neighborhood record shops and Georgetown is one of the best. No filler. 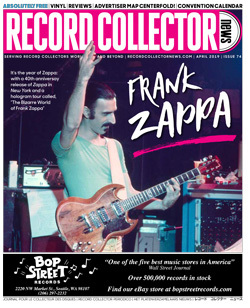 Tons of great clean collectable vinyl on site. 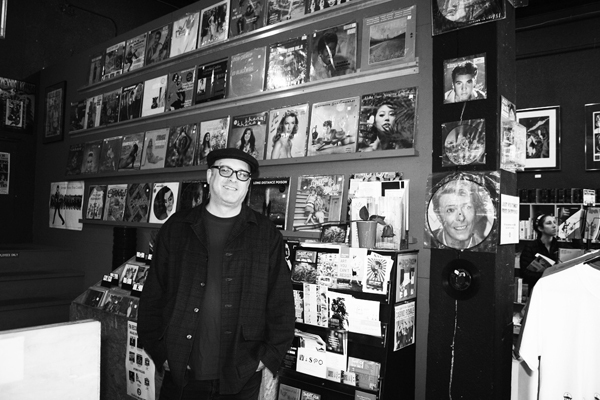 Georgetown Records owner Martin makes sure you leave happy. great list, surprised you didn’t make it to everday music in seattle. I’m going to have to get back up to Seattle soon. Still lots of good stores I haven’t visited. cool! definitely check out the melrose vinyl market next time. a lot of different vendors…you will be digging for hours. I agree with Kevin. The Melrose Vinyl Market is a must see. It’s like they’ve fit several stores into one large room. Hello, we’re pleased to tell you, that we just released our new album called: “KYBALION” in CD physical format and in english language.